Sansho Seiyaku developed Kojic Acid as a skin lightening ingredient, discovering the secret of sake brewers’ beautiful hands. It has been said that the hands of Japanese sake brewers are bright and clear. Based on the saying, we did a research on Japanese Koji used for brewing Japanese sake, miso and soy sauce. And we found out that Kojic Acid, produced as metabolites during fermentation, effectively inhibits the activity of an enzyme that promotes melanin production. 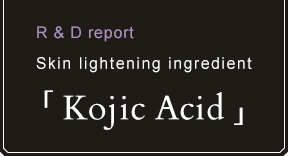 Therefore we started to develop Kojic Acid as a skin lightening ingredient. It took 13 years to develop the ingredient and finally it was approved as the first skin lightening active ingredient for quasi-drugs by the former Ministry of Health and Welfare since the revision of the Pharmaceutical Affairs Act in 1980. 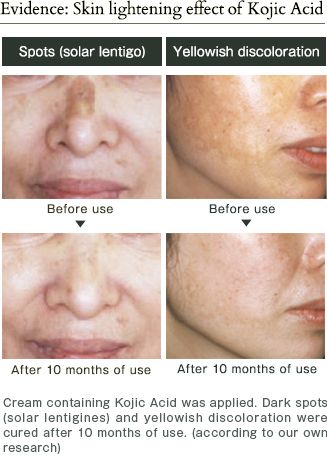 Kojic Acid is also used to treat dark spots at dermatology clinics for its highly effective skin lightening activity. Kojic Acid being approved as the first skin lightening ingredient was a breakthrough. Following the approval, many other skin lightening ingredients and cosmetics were launched in the early 1990s, which led to a skin lightening cosmetics boom in Japan. For its high efficacy, Kojic Acid is used to treat melasma and solar lentigines. At dermatology clinics, Kojic Acid cream is prescribed for pigmentation disorders. And darkened yellowish skin (yellowish discoloration) turned brighter and dark spots faded. Since the first approval in 1988, Kojic Acid was and still is considered as a standard skin lightening ingredient and its efficacy is recognized worldwide. 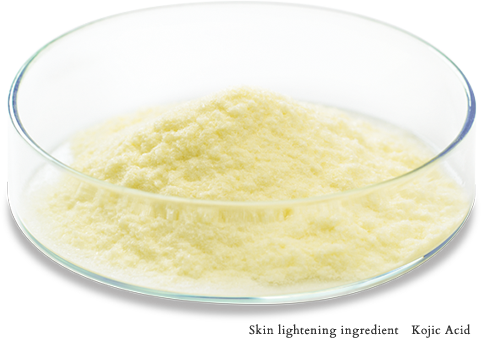 We provide Kojic Acid to major cosmetics companies in Japan and overseas as well. 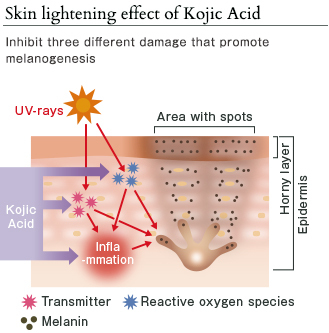 Kojic Acid prevents damage before the actual melanin production. Melanin is a pigment that gives skin and hair their color. It protects skin cells from UV damage, but it is also the cause of dark spots. Normally, excess melanin is excreted through cellular metabolism. But because of UV damage or hormonal imbalance, overproduced melanin is accumulated and it appears as dark spots. The most distinctive feature of Kojic Acid is that it prevents damage before the melanin production as well as inhibiting an enzyme that enhances melanin production. It is especially effective on inhibiting “production of transmitters”, “reactive oxygen species” and “inflammation”, thus prevents melanin production. With these mechanisms, Kojic Acid brings back your natural skin tone. Kojic Acid is also effective for wrinkles and sagging. As the word “photoaging” signifies, UV damage is the cause of not only spots but also wrinkles and sagging. And one of the triggers for those aging signs is reactive oxygen species (ROS) generated by UV-induced inflammation. ROS, a major determinant of aging, degrades collagen. Kojic Acid prevents inflammation and inhibits ROS generation. In other words, Kojic Acid lightens skin and at the same time it protects firmness and suppleness of skin, and it is clinically proved. 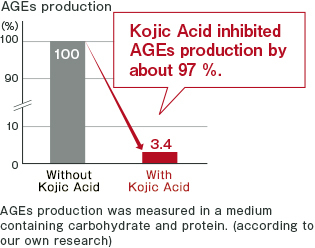 Kojic Acid prevents AGEs production with its powerful anti-glycation effect. As you age, skin tone changes to brownish yellow. This is because of AGEs (Advanced Glycation End Products) produced in glycation, a reaction of bonding proteins such as collagen and carbohydrate, which can happen in anyone’s body. AGEs, brownish yellow substance, tend to accumulate more and change skin tone to brownish yellow as you age. Clinical studies showed that Kojic Acid effectively lightened skin tone. Therefore we conducted studies once again and found out that it also inhibits AGEs production significantly. 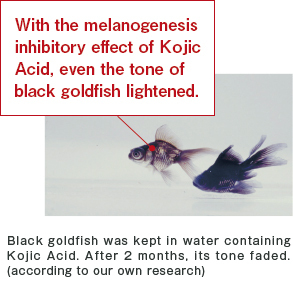 In the scales of black goldfish, the melanin pigment exists just like in human cells. After being kept in water containing Kojic Acid, color tone of the goldfish faded. This is because of the melanogenesis inhibitory effect of Kojic Acid. Later the goldfish was kept in water without Kojic Acid. And it turned back to its original black color. 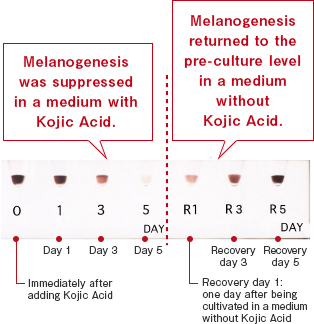 It indicates that Kojic Acid inhibits melanogenesis without damaging cells nor its function. It is a highly effective and safe ingredient. Melanocytes were not damaged, and skin function was not influenced. Melanoma B16 cells which produce melanin were cultured in a medium containing Kojic Acid. The cells were depigmented over time. Then the depigmented cells were cultured in a fresh medium without Kojic Acid, which led the color of the cells and cell activity to return to the pre-cultured level. This also indicates that Kojic Acid does not damage melanocytes, never induce incureable depigmentation and effectively lightens skin. Inhibitory effect of AGEs production, a cause of yellowish discoloration. AGEs, brownish yellow substance, are produced by glycation. 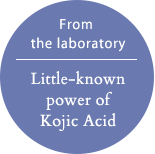 In a study measuring AGEs production, Kojic Acid showed significant inhibitory effect. It proves that yellowish discoloration cured in clinical studies was the result of Kojic Acid suppressing AGEs production. COPYRIGHT© SANSHO SEIYAKU CO.,LTD.ALL RIGHTS RESERVED.